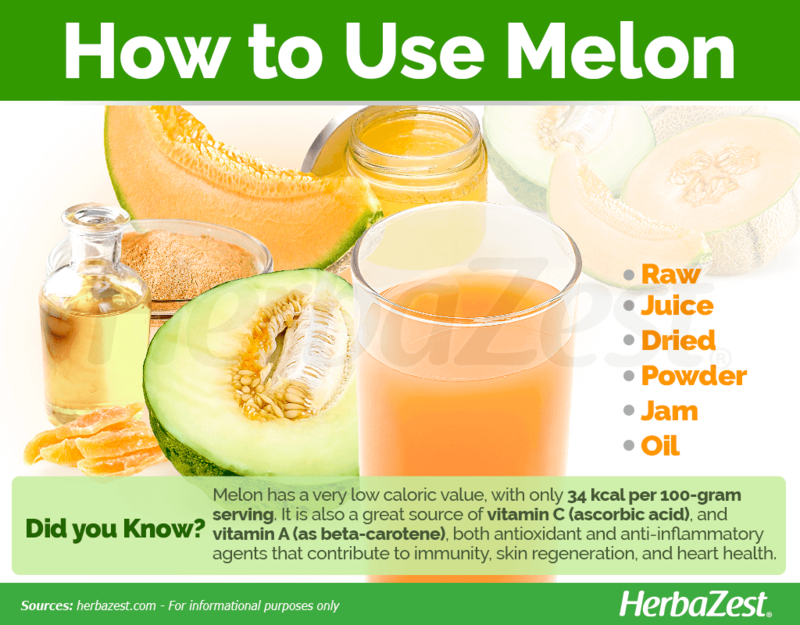 Melons, including honeydew and cantaloupe varieties, are popular fruits thanks to their sweet and refreshing taste, as well as their low-calorie content. However, melons are not only rich in nutrition, but also provide medicinal benefits. 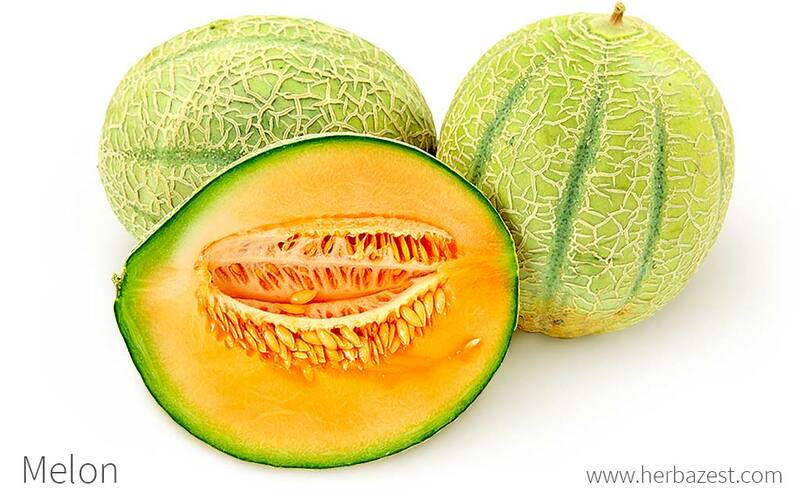 The melon fruit, also known as muskmelon, mush melon, and sweet melon, comes in different varieties, being among the most popular the honeydew and cantaloupe melons. Melons are originally from Africa, where they have been used for therapeutic purposes - mostly, against intestinal parasites - since before recorded history. Stimulating urine production. The diuretic properties of melon facilitate the elimination of sodium through the urine, thus helping reduce blood pressure. Enhancing the digestive process. Melons provide many essential nutrients and are low in fat, thus helping digestion and weight loss, as a part of a healthy diet. Additionally, melon possess antioxidant, anti-inflammatory properties, and it has been traditionally used for relieving skin irritations, such as superficial abrasions and burns. Not much is known about the specific compounds responsible for the medicinal properties of melon, although different types of flavonoids have been identified and are believed to play a role in their antioxidant properties. Studies suggest that the anti-inflammatory properties of melon are mainly related to its capacity to induce the production of interleukin 10 (IL-10), an anti-inflammatory cytokine that affects immunoregulation and inflammation processes in the human body. 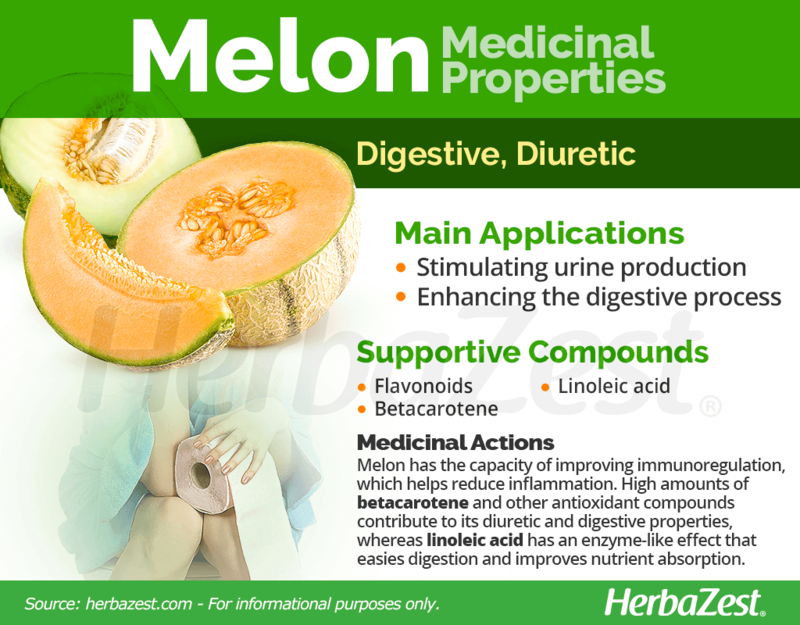 The diuretic properties of melon are attributed to its high amounts of antioxidant compounds, mainly beta-carotene. 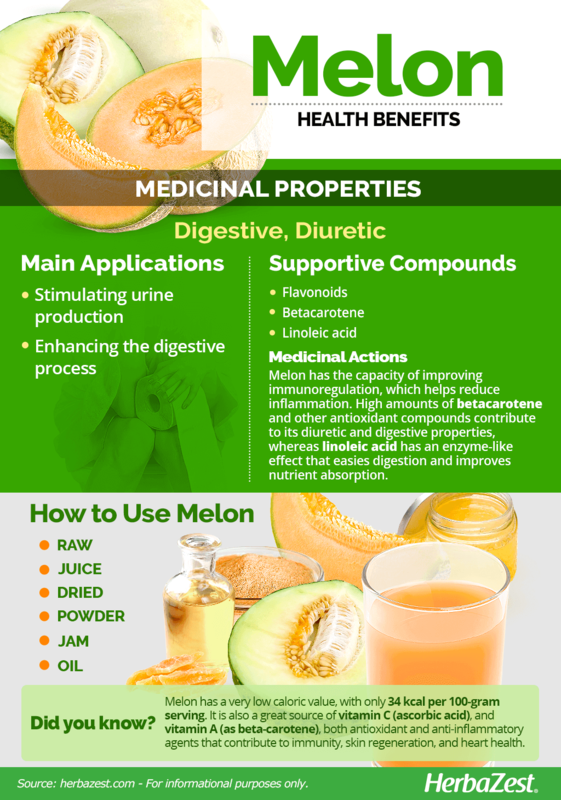 Furthermore, although its exact mechanism of action is yet to be understood, it seems that linoleic acid, a major fatty acid contained in melon seeds, has an enzyme-like effect in the gastrointestinal tract, easing the digestive process and improving the absorption of nutrients. Melon seems to have little to no potential for toxicity and no contraindications. Papaya and pineapple also have digestive properties, while asparagus and celery are a a good alternative for diuretic benefits. The melon fruit provides most of the essential nutrients required for a balanced diet; however, depending on the variety, the amounts can vary. While cantaloupe and honeydew melons possess similar levels of sugar and fiber, as well as most vitamins and minerals, cantaloupe is by far a much better source of vitamin C (ascorbic acid) and vitamin A (through beta-carotene); the honeydew melon, in comparison, provides only half of amount of vitamin C (which still is a good deal of this antioxidant nutrient) and close to none of beta-carotene. The combination of high levels of vitamins C and A in cantaloupe melons helps boost immunity and skin regeneration, and contribute to prevent infections and degenerative diseases. Additionally, the presence of dietary fiber and a low-calorie content, makes of these refreshing fruits a great addition to any dietary plan. They also provide adequate amounts of minerals, such as potassium, which is important for blood pressure control, and copper, which helps with red blood cells' production, as well as with the health of blood vessels, nerves, immune system, and bones. 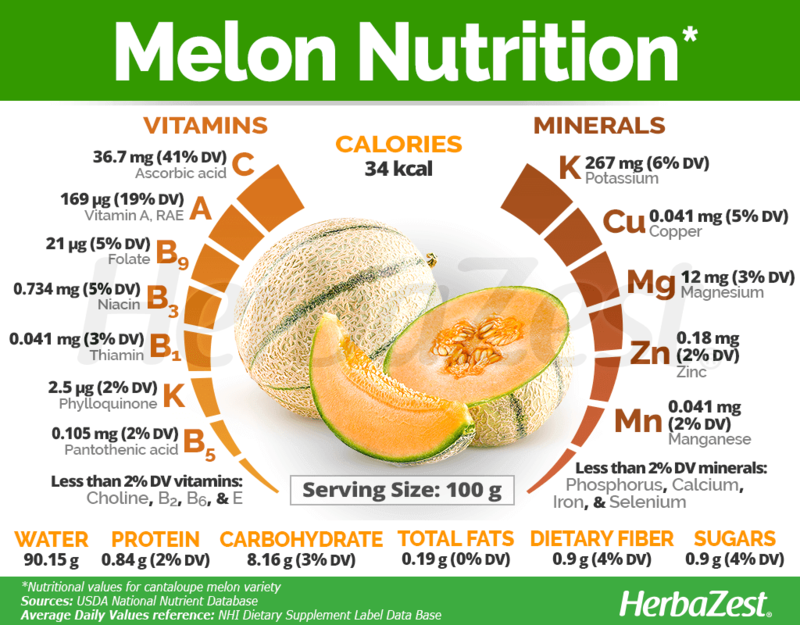 Muskmelon nutrition is rounded by proper amounts of vitamins B3 (niacin) and B9 (folate), as well as by small quantities of many other compounds, all of which add to its anti-inflammatory and diuretic effects. Given the sweet, refreshing taste of melon, it's an easy addition to any diet. Melons are packed with vitamins and nutrients and are low in fat, making them the perfect sweet snack or dessert. Raw. Ripe melons are primarily eaten raw, and they can be consumed alone, mixed with other fruits, or in salads. This is the best way to fully obtain their nutritional and medicinal benefits. Juice. Because they have high amounts of water, melons are also popularly consumed in juices and slushies, alone or mixed with other fruits and beverages. Dried. Melons are also commercialized in dried form, and consumed as a daily, low-calorie snack. Powder. Because of their amount of beta-carotene and fiber, melons are also consumed in powder form, as a natural antioxidant, digestive aid. Jam. Not as common as other forms of consumption, melons can be made into jam. However, their nutritional properties can be substantially reduced by the exposure to heath. Melon seed's meal could be work as a meat substitute, and also for animal and poultry feed or protein production. Oil. In various parts of Africa the melon seed's oil, rich in protein and fatty acids, is used in cooking. Due to its popularity, the melon fruit is widely available at most grocery stores, supermarkets and local farmers' markets. Since they are in season during summer, it is recommended to buy melons them between April and August, for the best ripeness and flavor. Other forms of melons, such as as powder and melon see oil, can be purchased online, and dried and candied melon, as well as packaged juice and jam are relatively easy to find year around in most organic markets and food stores. As a fully domesticated crop, melons are of great economical importance and mostly cultivated at a large scale. However, they can also be found growing naturally in disturbed sites, abandoned fields, along rivers, and open woods. Being an attractive climber, with pretty yellow flowers that attract pollinators, many gardeners are increasingly interested in growing melon at home. Melon vines grow best in warm, dry climates. They prefer open areas with well-drained, sandy, and slightly acidic soils. Melons require full sun exposure and plenty of water. The seeds are typically cultivated in nurseries and then transplanted. The plant is usually pruned after four or five pairs of true leaves have sprouted. In humid environments, melon vines are prone to develop fungal diseases. Harvest time is based on fruit maturity, which depends on the variety. Typically, melons are harvested a bit before they are fully ripe. Detailed information about growing melons can be found in the herb garden section. The melon plant is a climbing vine that can reach up to 10 feet (3 m) in length, and have alternate, simple leaves, rounded, with hairy and long petioles. The melon vine produces yellow flowers, and its fruits come in different sizes and colors. They are typically rounded with a white or gray rind, and orange, pink, or green flesh. Melon seeds are smooth, flat, and elliptic. Melon (Cucumis melo) is a member of the Cucurbitaceae family, which encompasses about 100 genera and 990 species of annual or perennial vines, including cucumber (Cucumis sativus) and pumpkin (Cucurbita pepo). Cucumis melo is divided into two subspecies, C. melo subsp. melo and C. melo subsp. agrestis. The three varieties of C. melo subsp. melo are the members of the species most commonly seen and consumed. They include C. melo subsp. melo var. cantalupo, which refers to the cantaloupe melon; C. melo subsp. melo var. inodorus, which is commonly called casaba or honeydew melon; and C. melo subsp. melo var. flexuosus, the Armenian cucumber, which is consumed mainly as vegetable, since its taste is similar to that of common cucumbers. In addition, C. melo subsp. agrestis has six accepted cultivars, being the most economically important C. melo subsp. agrestis var. chito, often referred to as the melon-apple; and the Asian C. melo subsp. agrestis var. conomon, known as pickling melon. While melons have been used for therapeutic purposes since before recorded history, it is thought that they were domesticated in the Mediterranean region around 1500 BCE, and regarded as a luxury food through the following 3,000 years, as they adorned banquet halls and royal feasts from England to India. Once melon was introduced to Spain during the 1500s and its availability increased, Western herbalists were able to study its medicinal properties. Melons supposedly arrived in the New World on Columbus' second voyage, where American Indians began growing them. By the following century, large-scale melon plantations had developed along the southeastern coast of what is now the United States. Melons have been highly regarded since their discovery, and they remain a popular sweet snack and dessert today. Melons play a significant role in the food industry due to their worldwide popularity. China, Turkey, Iran, and the United States collectively produce more than half of the world's melons. In 2010, the world production of melons was around 31 million tons, with China leading production.